Is there a Twelve Step program for knitters who start crazy projects? If so, please don’t tell me, because I love this kind of crazy. Like all things, I know the newness will wear off and I will start to lag, however I’m enjoying the shininess of it while I can. This craziness is The Beekeepers Quilt. As of right now, I’m taking a slightly different angle on this than the normal scrappy quilt. I’m hoping to make it into a Grandmothers Garden type of quilt. This is an ambitious project. Since I rarely do crazy alone, I also roped my friend Knittymuggins into knitting one with me. Yay for enabling! My hope is that I can do this mainly with stash sock yarn. I may have to supplement a little, especially if I want to keep the background color the same tan. 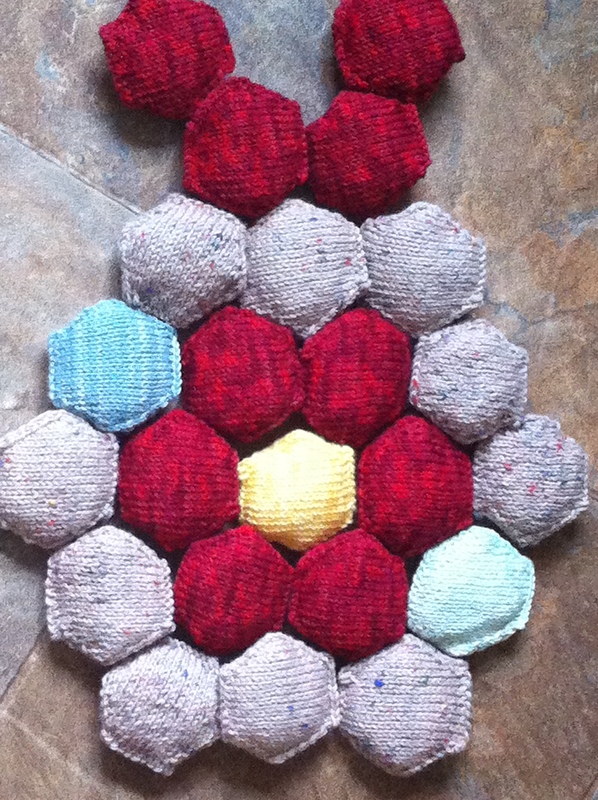 Since I get about 12 hexi-puffs out of one skein, it’s a great stash busting project. Some of you have asked of I’ve gotten my shipment of yarn from Sock Summit yet. The answer is no. I did actually talk to our delivery guy when the poor guy unwittingly came to our door with another package. I’m sure he didn’t expect to be jumped on by 2 girls and their mom about whether the yarn had arrived yet. Basically the short answer is that no one seems to know where my box is. Duluth claims that it never left Washington state. However on Aug 8 I was told it was in Duluth. I’ve passed through denial in the stages of grief and I think I’m entering into anger and bargaining. When we mail gifts or whatever back to the Midwest from the Seattle area, it seems to take around 10 days or so. Hopefully your package will still arrive! I’ve not had anything go missing except a handknit hat, and that fell out of the mailer; at least I think that’s what happened. Good Luck! How was the Summit? We were IN the Midwest at the time….really hot and really, really buggy. We are real wimps in that regard…..
Oh I so hope your box arrives…and I LOVE the Bee Keepers Quilt. I like how yours looks and it will be a wonderful project to work on over time. I think this looks like an awesome project! Too bad people can’t feel the yarn you are using…it is SO soft! “Roped” me into your crazy, huh? I don’t know….. it sure didn’t take much arm twisting to get me on board 😉 And I know exactly what you mean! I am fiendishly working on these during pretty much every Knittymunchkin mealtime. Love your Grandmother’s Garden idea! Still feeling so crappy about your package 😦 I hope it shows up eventually. That just freakin’ *stinks*.